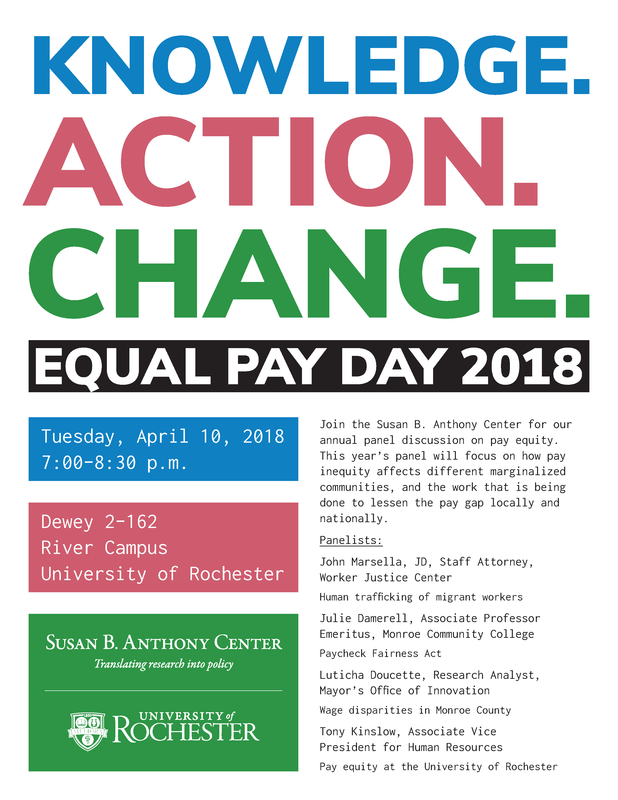 Join the Susan B. Anthony Center for our annual panel discussion on pay equity. This year’s panel will focus on how pay inequity affects different marginalized communities, and the work that is being done to lessen the pay gap locally and nationally. Julie Damerell, MS, Associate Professor Emeritus at Monroe Community College, will talk about the Paycheck Fairness Act. John Marsella, JD, is a Staff Attorney with the Worker Justice Center of New York. For the past five years, John has carried an active litigation docket representing individuals in cases arising under civil rights, labor and employment, and human trafficking law. John’s successes include securing judgments on behalf of survivors of human trafficking, discrimination, and wage theft; defeating dispositive motions in multi-plaintiff discrimination lawsuits; and helping marginalized workers engage with employers regarding exploitive workplace conditions. Prior to WJCNY, John served as an Intern with the United States Department of Labor and Law Clerk with the National Labor Relations Board. He received his B.A. in Political Science from the University of Rochester in 2008 and his J.D. from American University, Washington College of Law in 2013. Julie Damerell, MS, is an Associate Professor Emeritus in the Transitional Studies Department at Monroe Community College and taught developmental reading/writing there from 2001. While there she also served as Chair of the Teaching & Creativity Center, and helped to develop and deliver STEM/APPLIED STEM Institute for Faculty: Course Design for Active and Collaborative Learning in the summers. Prior to that, she taught at Naples Central School as a remedial reading teacher. Ms. Damerell is the editor of miller’s pond (http://millerspondpoetry.com) and has published poetry in print and online several places, including Byline, Bellowing Ark, Melic Review, and Move Angelus Literary Arts. She has essays published in Mother Voices and online in Ellavon: An Ezine of Literary Culture. Luticha Doucette graduated from the Rochester Institute of Technology with a BS in bioinformatics. She is a former Ms. Wheelchair New York (2011) and was 2nd Runner Up at Ms. Wheelchair America 2012 with a platform of science education for those with disabilities. Her passion for science translated to her previous job as a researcher/bioinformaticist in genomics at the University of Rochester. In the summer of 2015, she embarked on a different career path as a research analyst for the newly formed Mayor’s Office of Innovation and Strategic Initiatives, a data driven research and development team whose current efforts are focused towards reducing poverty in a targeted area in partnership with the Rochester Monroe Anti-Poverty Initiative. Luticha’s heart is always rooted in advocacy: she has made several radio appearances and serves on the boards of two advocacy organizations. Anthony (Tony) Kinslow, JD, has professional experience in higher education and health care, including service at Vanderbilt and CalTech. Prior to joining the University of Rochester, he worked at the Cleveland Clinic in Ohio, which included a stint in Abu Dhabi. Kinslow has been with the University of Rochester since March 1, 2015 in the capacity of Associate Vice President of Human Resources and Chief Human Resources Officer. In this position, he has responsibility for the Human Resource functions of New York State’s 5th largest private employer with over 23,800 full time employees. Born and raised in Tennessee, Kinslow attended undergraduate school at the US Air Force Academy and California State University, Sacramento; received his master’s degree in international relations from University of Southern California; and earned his doctorate of jurisprudence from Vanderbilt Law School. He retired from the US Air Force Reserves with the rank of Lieutenant Colonel.